Spiral staircase for outdoor use. This spiral staircase meets all the requirements for design, appearance and functionality of a modern day exterior staircase. The treads are perforated plate ideal for safety and comfort. TORONTO Spiral staircase from DOLLE constructed in metal and suitable for both indoor and outdoor use. Designed for convenience, from the balcony to the garden occupying the smallest of space! The DOLLE Toronto is the ideal solution! 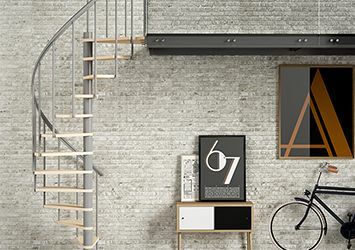 Available with up to of five additional steps, the DOLLE Toronto reaches a floor height of 399.5 cm with the safety and comfort perforated steel steps. 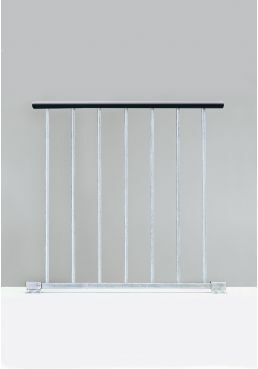 The banister with round bars is hot-dip galvanized and finished with a rounded plastic handrail. Additional options include a parapet railing which can be ordered on request. The treads are made of hot-dip galvanized perforated sheet steel and are very durable easy to maintain and clean. The perforation on the top tread is slip-resistant and ensures effective drainage of water, for safe access. Spiral staircase - STAY SAFE AND CONSIDER THE FOUNDATIONS! As a safe basis, a foundation is necessary for the DOLLE Toronto. Plan the foundation at least 40 cm x 40 cm x 80 cm (L x W x D). This information corresponds to normal soil conditions with grown soil. The stair can be used as left- or right turn and can be used for round or square openings. This Spiral staircase comes with 11 treads up to 15 treads (just pick your height) + landing and continuous flexible handrail. Do you have any question regarding the DOLLE Toronto outdoor staircase please call the office - we are happy to help. 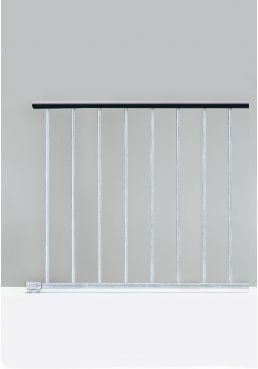 The landing banister can be added pick it here on this page. DOLLE Toronto is available in 2 diameters 125 and 155cm.